For a list of my books at Amazon.com, click here. 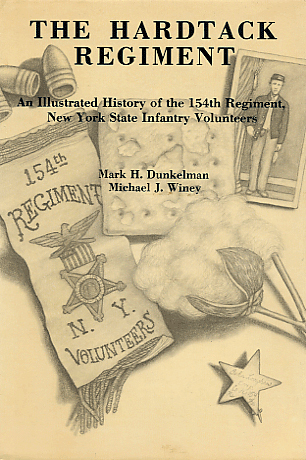 The Hardtack Regiment: An Illustrated History of the 154th Regiment, New York State Infantry Volunteers with Michael J. Winey. (East Brunswick, N.J.: Fairleigh Dickinson University Press, 1981). The Hardtack Regiment traces the progress of the 154th New York Infantry Volunteers from the regiment’s organization in 1862 in Cattaraugus and Chautauqua counties to the mustering out in 1865. During its service the 154th New York participated in some of the great campaigns and battles of the war. At Chancellorsville, the regiment’s stand against “Stonewall” Jackson’s famous attack made its first battle a disastrous and bloody one. At Gettysburg, a similar forlorn fight decimated the regiment further. But the remaining soldiers continued to fight and suffer in the subsequent campaigns for Chattanooga and Atlanta and participated in Gen. William T. Sherman’s destructive march through Georgia and the Carolinas. When the Hardtack Regiment disbanded after the close of the war, the veterans returned to their homes and farms in western New York, and the story of the 154th faded into individual memories. Around the turn of the century, an attempt was made but not completed to write and publish a history of the regiment. By the 1960s, when the present authors individually began to study it, the 154th was forgotten. In this history the soldiers of the Hardtack Regiment, officers and privates, live and speak again through the several diaries and accounts and the hundreds of letters located by the authors during years of research. Much of this material was made available by descendants of members of the regiment; other portions came from institutions around the country. The members of the Hardtack Regiment included two Medal of Honor winners, a brigadier general, and the sergeant who fell at Gettysburg and became for a time the country’s most famous unknown soldier. A section of brief biographical sketches serves as in introduction to these and selected other soldiers. Also included in the book are 13 maps and 124 illustrations, many of them previously unpublished, of which 78 are portraits that accompany the biographical sketches. “The book is a gem.” Buffalo Evening News. Gettysburg's Unknown Soldier: The Life, Death, and Celebrity of Amos Humiston (Westport, Conn.: Praeger, 1999). He was found dead on the battlefield of Gettysburg, an unknown soldier with nothing to identify him but an ambrotype of his three children, clutched in his fingers. With the photograph as the single, sad clue to his identity, a publicity campaign to locate his family swept the North. Within a month, the bereaved widow and children were located in Portville, New York, and the devoted father was revealed to be Sergeant Amos Humiston of the 154th New York Volunteers. Using many previously untapped sources, this book tells the tale of nineteenth century war, sentiment, and popular culture in greater detail than ever before. The Humiston story touched deep emotions in Civil War America, and inspired a flood of heartfelt prose, poetry, and song. Amid a vast outpouring of public sympathy, a charitable drive evolved to assist the bereft family. At the end of the war, the crusade was expanded to establish a home at Gettysburg for orphans of deceased soldiers. The first residents of the institution were Amos Humiston’s widow Philinda and her three children: Franklin, Alice, and Frederick. In this extensive account, a full portrait emerges of Amos Humiston, the loving husband and father destined to be remembered for his death tableau, and his family, the widow and orphans who struggled for the rest of their lives with celebrity born of tragedy. “Dunkelman’s well-researched and deeply felt narrative offers and effective and fascinating look at how the tragedy experienced by the Humiston family fit into Civil War-era assumptions about patriotism, fame, religious belief, and sentimental notions of sacrifice.” Journal of Southern History. To read "Whose Father Was He? ", Errol Morris's five-part New York Times essay based on the book, click here. For information about the book, visit its page on the ABC-CLIO website. 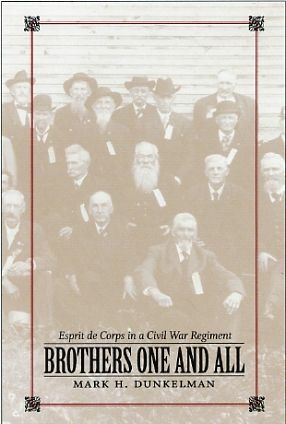 Brothers One and All: Esprit de Corps in a Civil War Regiment (Baton Rouge: Louisiana State University Press, 2004). During the Civil War, the regiment was the fundamental component of armies both North and South, its reliability and effectiveness crucial to military success. Soldiers’ devotion to their regiment – their esprit de corps – encouraged unit cohesion and motivated the individual soldier to march into battle and endure the hardships of military life. Although historians have often remarked on the importance of esprit de corps within Civil War regiments, few have examined the phenomenon in depth. In Brothers One and All, Mark H. Dunkelman identifies the characteristics of Civil War esprit de corps and charts its development from recruitment and combat to the end of the war and beyond through the experiences of a single regiment, the 154th New York Volunteer Infantry. Dunkelman offers a unique psychological portrait of a front line unit that fought with distinction at Chancellorsville, Gettysburg, Lookout Valley, Rocky Face Ridge, and other engagements. Drawing on three decades of research and more than a thousand wartime letters and two dozen diaries kept by members of the 154th, he traces the evolution of natural camaraderie among friends and neighbors into a more profound sense of pride, enthusiasm, and loyalty forged as much in the shared unpleasantness of day-to-day army life as in the terrifying ordeal of battle. Brothers One and All reveals precisely how esprit de corps gave the men of the 154th reason to keep marching and fighting despite boredom, homesickness, illness, and the death of comrades. And while Dunkelman notes the limits of regimental loyalty in instances of cowardice, malingering, and desertion, he finds that most of the men shared an abiding concern for their regiment’s reputation and honor. Even after war’s end, a strong sense of esprit de corps survived among veterans, who for decades attended regimental reunions and contributed to war memorials. With freshness and striking effect, Dunkelman has re-created the particular experiences of the 154th while offering universal insights into the nature of war and the bonds between soldiers. To hear me talk about my book Brothers One and All on Civil War Talk Radio, click here. For information about the book, visit its page on the Louisiana State University Press Web site. 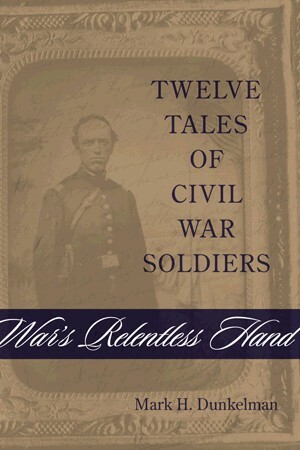 War's Relentless Hand: Twelve Tales of Civil War Soldiers (Baton Rouge: Louisiana State University Press, 2006). A happy-go-lucky soldier falls at Gettysburg. An officer survives a hair-raising escape after capture at Gettysburg, only to die in the Atlanta campaign. A young volunteer retreats into insanity. Though they did most of the fighting and dying in the American Civil War, “ordinary” soldiers largely went unheralded in their day and have long since been forgotten. Mark H. Dunkelman retrieves twelve of these common soldiers from obscurity and presents intimate accounts of their harrowing, heartbreaking, and occasionally humorous experiences. Their stories, true to the last historical detail yet as dramatic as the most powerful fiction, put a human face on the terrible ordeal of a country at war with itself. These were soldiers from the 154th New York Volunteer Infantry, a regiment that Dunkelman has studied for forty years. He weaves a complex and personal portrait of each man--portraits that reveal how, even for the common soldier, war was a cataclysmic event forever marking his life and the lives of those around him. Through a vast array of primary sources, Dunkelman reconstructs the lives and legacies of soldiers who died on the battlefield and others who later died of war-related injuries, some who were permanently disabled and others who saw their families undergo trauma. A reluctant soldier is doomed by red tape. A veteran is crippled for life because of his brutal treatment as a prisoner of war. Father and son are killed at Chancellorsville. A dying private is immortalized by Walt Whitman. Separated by the war, a husband and wife agonize when their children contract a deadly disease. A veteran claiming he was blinded by campfire smoke is at the center of one of the largest pension scandals of the postwar era. Recalling a lost world, War’s Relentless Hand tells of the resilience, perseverance, and loyalty that distinguished these men, the families and communities that supported them, and the faith and character that sustained them. Though the full human cost and grief of the Civil War can never be calculated, deeply felt and carefully retold lives like these help convey its magnitude. Marching with Sherman: Through Georgia and the Carolinas with the 154th New York (Louisiana State University Press, 2012). Marching with Sherman: Through Georgia and the Carolinas with the 154th New York presents an innovative and provocative study of the most notorious campaigns of the Civil War—Union General William Tecumseh Sherman’s devastating 1864 “March to the Sea” and the 1865 Carolinas Campaign. The book follows the 154th New York regiment through three states and chronicles 150 years, from the start of the campaigns to their impact today. Mark H. Dunkelman expands on the brief accounts of Sherman’s Marches found in regimental histories with an in-depth look at how one northern unit participated in the campaigns and how they remembered them decades later. Dunkelman also includes the often-overlooked perspective of southerners—most of them women—who encountered the soldiers of the 154th New York. In examining the postwar reminiscences of those staunch Confederate daughters, Dunkelman identifies the myths and legends that have flourished in the South for more than a century. 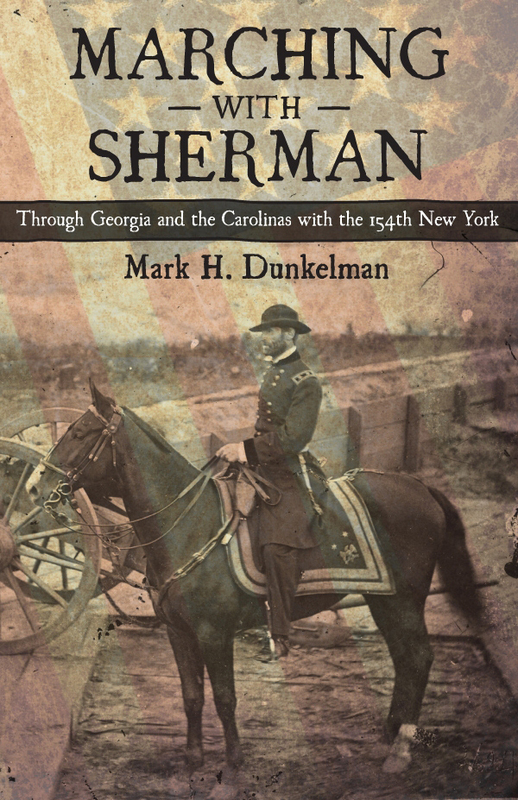 Marching with Sherman concludes with Dunkelman’s own trip along the 154th New York’s route through Dixie—echoing the accounts of previous travelers—and examining the memories of the marches that linger today. To hear me talk about my book Marching with Sherman on Civil War Talk Radio, click here. Patrick Henry Jones: Irish American, Civil War General, and Gilded Age Politician (Baton Rouge: Louisiana State University Press, 2015). This is the first full-length biography of Patrick Henry Jones (1830-1900). 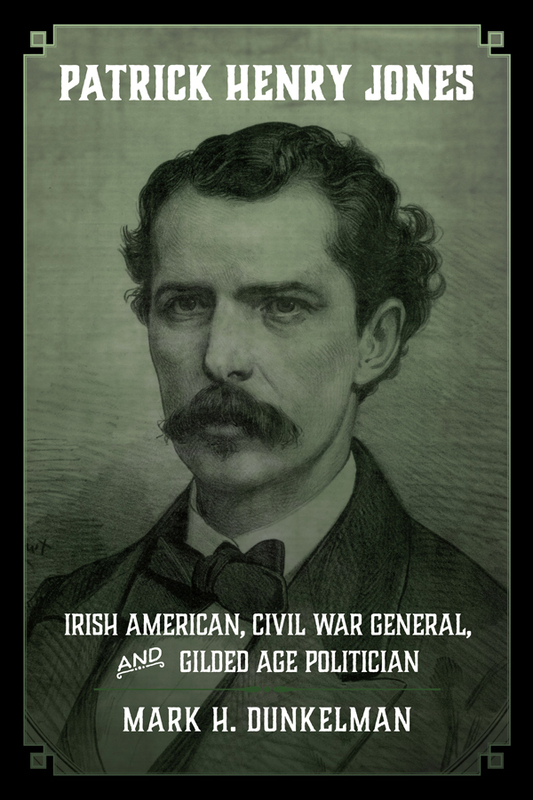 A native of Ireland, Jones overcame the xenophobia that confronted immigrants in mid-nineteenth century America to attain a level of prominence equaled by few of his peers. His outstanding service in the Union army during the Civil War caused him to be promoted in successive steps from second lieutenant to brigadier general, one of only twelve native Irishmen to reach that rank in the Federal forces. The war over, his reputation as a military hero enabled him to undertake a career in politics. Serving in both elective and appointive offices, he became one of the best-known Irish-American politicians of his era. From the humblest of roots, Jones rose to military and political heights on the basis of his abilities and accomplishments, aided by his patrons Reuben E. Fenton—congressman, governor, and senator—and Horace Greeley, the famous editor. Having climbed to a lofty place in American life, Jones encountered perils in the political upheavals and corruptions and scandals of the Gilded Age. Appointed to an important office by President Ulysses S. Grant, Jones was faced with a dilemma when his mentor Greeley ran against Grant in the 1872 election. Meanwhile, malfeasance by subordinates tarnished Jones’s reputation and ruined him financially. Then he was laid low by a peculiar involvement in one of the most sensational crimes of the era, which sullied his name and left him a shadow of his former self. Jones was one of the most famous Irish Americans of his day, but until now he has largely been forgotten. This biography resurrects Patrick Henry Jones’s memory and restores him to his rightful place as an ethnic military hero and a politician of influence. In so doing it contributes new insights in the fields of ethnic studies, Civil War history, New York City postwar politics, the Grant Administration, and Gilded Age chicanery. Thanks to friend Damian Shiels of County Cork, Ireland, for his review of the book on his weblog Irish in the American Civil War. To hear me talk about my book Patrick Henry Jones on Civil War Talk Radio, click here.